Watch out, Swiss misses and misters -- the Spy Girls are hitting the slopes! The disappearance of a hot young rock star has been linked to a bizarre international conspiracy -- and the secret may be hiding in the remote, snow-covered mountains of Switzerland. Their base of operations, a glamorous ski resort, has Jo, Caylin, and Theresa so stoked they can barely keep their minds on their mission. Will all play and no work lead to a tragic end for the Spy Girls? "Beam me out of here," Jo Carreras muttered as she and Theresa Hearth entered the now familiar white plastic conference room of The Tower for another debriefing. "This place needs a major makeover. The latter-day mother ship motif is way out." "Tell it to Uncle Sam," Theresa replied. She gently set her laptop on the pristine white conference table that stretched the length of the entire room. It had to be at least twenty feet long. "Maybe he'll turn you loose with The Tower platinum card." "Yeah, right. Only if we save the world just one more time." Jo flipped her long black hair out of her face. Then she snatched a blueberry muffin from a small tray of juice, bagels, muffins, and other breakfast treats in the center of the conference table. The tray was the only thing in the room that hinted at warmth. Let alone humanity. Actually, there was a time when the sight of this conference room/bad Trek set creeped Jo and Theresa out. Now it wasn't eerie so much as tacky. But back then, they were just raw recruits thrown together to save the Free World from Evil and other capitalized words. They'd been so green when the organization known only as The Tower had trained them as secret agents. Naturally, their enemies underestimated three teenage girls. But the adventures had been intense. Dangerous. Thrilling. Terrifying. And exhausting. They had defused bombs, fallen out of airplanes, hacked into top secret computers, run from the law, and trotted the globe using false identities. They had used gadgets that would make James Bond drool. They wore fabulous couture that would make him drool even more. Soon they stopped being just girls. They became the Spy Girls. Jo glanced around and blinked her large ebony eyes. "Where's Caylin?" Then they heard a high-pitched "Kiii-yai!" The door at the opposite end of the room flew open, and Caylin Pike burst in, blond ponytail flipping, fists wrapped in athletic tape. She danced back and forth, boxing the air and twirling while she executed a series of wicked roundhouse kicks. "It's about time," Jo murmured. Caylin whooshed past Theresa and headed toward Jo's seat. She punched with each step -- "Ya! Ya! Ya!" -- all the way up to Jo. Then Caylin launched a final sidekick that came within an inch of Jo's nose. "Now that's what I'm talking about." Caylin grinned, holding the foot in front of Jo's face. Jo didn't even flinch -- except to wrinkle her nose. "Ever hear of foot-odor spray?" she asked. Caylin swung her foot back to the ground and stood in place. Her shoulders slumped. "I do not stink!" "Your feet do," Jo replied with a wry smile. Caylin ignored her, choosing instead to plop her foot on the conference table, bend forward, and stretch her hamstring. "This tae-bo stuff is unreal. It's total body kamikaze. You guys have to try it. You'll die." "Just what I want out of a workout," Theresa said. "No thanks, Van Damage," Jo added. "You work out enough for all of us." "You don't even know what working out is." Caylin scolded, massaging her calf. She paused to snag a bottle of water from the tray. "Working out?" Theresa asked, looking confused. She turned to Jo, shrugging. "Never heard of it." "You know, weights, treadmills, ambulances," Jo quipped. "You've seen the infomercials." Theresa widened her gray eyes in mock surprise. "That's working out? Ew!" "God forbid you break a sweat," Caylin grumbled. "You break the sweats, I'll break the codes," Theresa replied, patting her laptop. "So what does Jo break?" Caylin asked. "Hey!" Jo erupted, throwing a muffin. It exploded against Theresa's arm, sending chunky crumbs across the spotless white table. "You're supposed to be the quiet one!" "You should try quiet sometime," Theresa said with a laugh, brushing crumbs away. "Very funny," Jo said with an exaggerated toss of her dark hair. "The only thing I break is hearts, Spy Geek. Don't you forget it." "Yeah, I heard that enemies of state all over the world are paying big bucks for the latest satellite pics of you sunbathing on The Tower roof," Caylin pointed out. Caylin and Theresa exploded in giggles and groans. "Yeah, right!" Jo sighed melodramatically and shook her head. "It's so hard being beautiful, brilliant, and top secret." "Ahem," came a deep voice from all around them, as if from within the walls. "Uh-oh," Caylin said, glancing about. "The Sam-man cometh. Cease all fun." The lights dimmed. A large video screen emerged from the far wall, blinking and humming. Gradually the pixelated image of Uncle Sam, their boss, came to life before them. As usual, they couldn't make out any of his features. "Greetings, Spy Girls," Uncle Sam said. "How are the debutantes of détente today?" "My word, Uncle Sam," Jo gasped. "What have you done with your face?" "I always look like this, Jo," Uncle Sam replied. Jo rolled her eyes. "That was a joke. You know -- what have you done with your face...like, 'where is it?'" "I know what you meant, Jo," Uncle Sam replied dryly. "Do you think you're the first operative to come up with that one?" "Oooh, have some, Spy Girl!" Caylin whispered. "Yeah, yeah, yeah," Jo grumbled. "Dish it, Sammy. What's this week's crisis?" "Well, it's a crisis, all right," Uncle Sam replied. "But it's a little different this time out." "Let me guess," Jo interjected. "Forty nuclear warheads have been stolen from Russia, and we have to infiltrate the Moscow mob. Dressed as nuns." "No, that's not it," Caylin said. "We have to go to Nepal to rescue the Dalai Lama from a band of rebel Sherpas." "Dressed as nuns," Jo repeated. "If you two are finished?" Uncle Sam replied coldly. "We have to go up in the space shuttle!" Caylin went on. "Go undercover as Dallas Cowboy cheerleaders!" Jo countered. "Now that would be cool," Caylin agreed. "That's quite enough!" Uncle Sam exclaimed. The girls paused, staring at the screen. Finally Jo muttered, "He is so decaf this morning." "As I was saying when I was so rudely interrupted," Uncle Sam continued, "your next mission is a bit different. I assume you are all familiar with the Mediterranean principality Zagaria, along with its royal family." "Correct. The eighteen-year-old princess. Her mother, Queen Cascadia. And Prince Arthur, who just turned fifteen." "Lucky kid," Caylin commented. "That's big bucks." "Who'd want to be a royal?" Theresa scoffed. "Talk about lack of free will." "Funny you should say that, Theresa," Uncle Sam said. "Because it's exactly free will that has the palace in an uproar. It seems Kristal has been exercising her free will a little too freely these days." "Let me guess," Jo piped up. "It has something to do with her boyfriend, Rook." "Exactly," Uncle Sam replied. "How did you know?" Jo smiled. "I read the newspapers." "Ha!" Theresa replied. "Like the International Trasher?" Jo scowled. "That's Tracker, giga-girl! If you spoke any language other than Java, you'd know that it keeps its finger on the pulse of pop culture like no other newspaper." "At a second-grade reading level," Theresa argued. "There's not enough soap in the cheesiest of operas to wash the dirt out of that rag." "Ladies!" Uncle Sam said. "If I may?" Jo and Theresa fell silent. "Here's the situation: Kristal has run off to Schnell to do a little skiing in the Swiss Alps. The royal family is fairly certain that Rook is with her. Queen Cascadia fears that this could lead to more complicated -- and permanent -- romantic matters." "Like marriage," Uncle Sam confirmed. "It's no secret the queen doesn't like Rook. If Kristal and Rook marry, the implications for the monarchy would be huge. Her Majesty has requested that The Tower locate the princess and return her to Zagaria." "Schnell," Jo said in awe. "That's the most exclusive ski resort in Europe." "With the best snowboarding in the world," Caylin added. Theresa shook her head at her comrades' enthusiasm. "Doesn't the royal fam have bodyguards to handle this kind of stuff? I mean, why do we have to go?" "Are you nuts, Theresa?" Jo demanded. "This is a cakewalk right into the jaws of luxury. It's Schnell!" "The point, Theresa," Uncle Sam replied, "is that Kristal doesn't want to be found. Surely you know her reputation. She'd rather be the rock star that she is than a princess. She and Rook have been on the front cover of every tabloid in the world. This is her way of rebelling against her upbringing. Schnell isn't that big a town, but there are many intimate places for a girl like Kristal to hide. She goes there often, so she must have dependable people willing to keep her whereabouts discreet for a bribe. She would see royal bodyguards coming a mile away. On the other hand, three American girls who are fans just might be able to get close to her." "Skiing and jet-setting," Caylin mused. "Sounds like a choice little mission." "My advice would be to follow the paparazzi," Uncle Sam suggested. "They know the clubs where Kristal has been giving surprise concerts." "What's your malfunction?" Jo asked. "Nothing's going to blow up, no one's going to die, and the world is still safe for democracy." "That's the point," Theresa replied. "Shouldn't we be doing something a little more challenging? We've proven ourselves. Isn't there a real crisis out there somewhere?" "Yeah, in your head," Jo muttered. "T., we couldn't ask for a better mission." Caylin paused. "Actually, after our little fiasco in Seattle, we very well should ask for a better mission." "Ask and ye shall receive," Uncle Sam said. "Theresa, relax and enjoy this one. If you pull it off, there's a whole week of rest and relaxation in Schnell for the three of you, courtesy of the royal family and The Tower." "Are you kidding?" Jo squealed. "That is totally Gandhi of you, Uncle Sam! I take back all the things I said about your face!" "Thank you, Jo," Uncle Sam replied. "But there is one thing..."
"What, pray tell?" Jo asked. The pixels in Uncle Sam's image multiplied into a mischievous smile. "You have to find the princess in seventy-two hours." Theresa snorted. "Three days? Yeah. Okay. Sure. Nothing like chasing a spoiled brat through a maze of clubs full of Euro-snobs smoking cigarettes that cost more than my haircut." "We'll do it," Jo declared. "No problem," Caylin agreed. "Sorry, T. You might actually have to go outdoors on this one." "Ha ha," Theresa replied. She glumly raised her glass of orange juice. "Here's to world peace." "Nah, here's to cool slopes and hot tubs," Jo shot back. 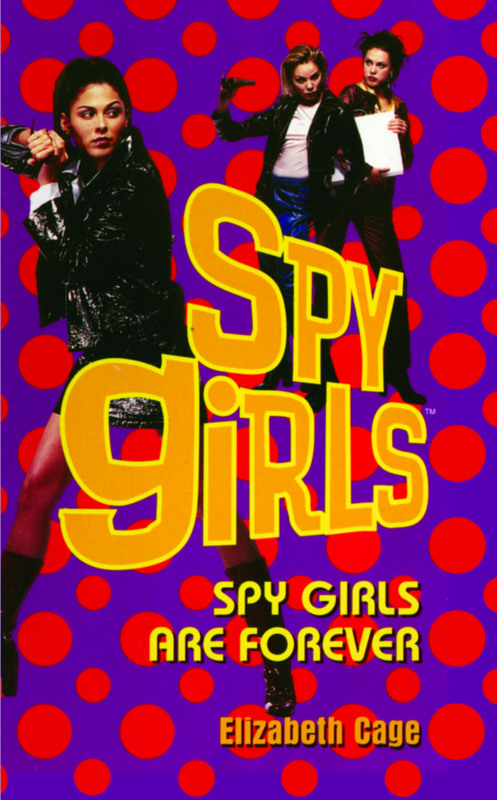 "Good luck, Spy Girls," Uncle Sam declared. "I'll contact you when you reach your home base in Schnell. I think you'll find your accommodations quite...accommodating." Caylin stood and raised her drink as well. "Let's rock and roll, ladies!" Two juice glasses and one water bottle clicked together. And then the Spy Girls were off.